Isn’t Tubing Supposed to be Fun? 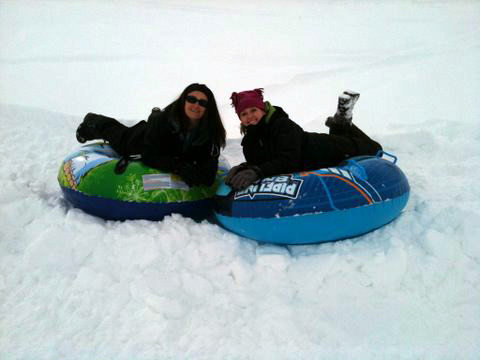 You’ve been tubing before. You know the experience. You get all bundled up in thick, warm winter gear so you can carry your heavy tube all the way up to the top of a steep and endless mountain covered with snow that traps your feet with every step, leaving you exhausted and longing for the end. Soon you find yourself removing your protective clothing because it’s just too hot… until you crash into a snowbank and shiver for the next few hours because you’re now all wet. And after that sweat inducing climb, when you finally are rewarded with the chance to hop on your tube or sled for a 10 – 30 second thrill ride, you come to a stop at the bottom of the same long mountain you now have to climb back up again. let’s be honest. Snowtubing is fun, but it can be hard to remember that. Why, because of all the work it requires. Wasatch Snowcat can take the hard work away and make the whole experience feel like more fun. We will load your group’s snow tubes or sleds onto our Snowcat, then race you all up the mountain while you’re sitting comfortably and warm inside, enjoying a well deserved, relaxing break. Suddenly the best part of snow tubing is all you’re doing. You’ll be racing down the mountain over and over in absolute joy, laughing and joking more than you ever have on any previous snow tubing occasion. Trust us, it’s pretty awesome! We can make your next snow tubing adventure a fun group or family memory. We will take your group to the top of rolling hills on the serene dry farms in the beautiful Morgan Valley. Ride down, then our Snowcat picks you up at the bottom of the hill and take you back to the top again and again and again. It’s like endless fun until you really just can’t do anymore! This event runs January 1st to March 15th, requires a reservation and will operate when weather and snow conditions allow. Cat Tubing costs $99.00 per person.. although group rates may be available.